There are arguments for and against the evaluation of people. The why, how and what of these psychological and behavioural evaluations largely differ, so what are the options for those responsible for people management in the workplace? The evaluation of people in the workplace makes sense. But the techniques used are often superficial, inappropriate, intimidating, subjective, invalid, unreliable and culturally biased. Invalid assessment results may cause individuals to be labelled or stereotyped, disregarded and marginalised, or in most cases even promoted beyond their level of competence. Evaluation methodologies include relying on academic achievements, psychometric test results, structured and unstructured interviews, assessment centres, simulation exercises, situational judgement tests, 360 degree competency based evaluations, and annual performance reviews. Gaming techniques, referred to as gamification, are also currently in vogue. But shortcomings of most of these techniques are regularly pointed out. The use of academic performance to predict work performance is controversial. There is indeed abundant evidence that those who come up with the most valuable work-related contributions, were not necessarily academic achievers at school and university. Some of the “Big Four” accounting firms have therefore removed academic qualifications and achievement as entrance criteria for job applicants. IQ tests measure primarily logical-analytical thinking as applied in a linear and convergent manner to come up with a correct answer in a structured knowledge domain. IQ tests are usually timed or have time limits, so speed and power factors also contaminate one another. These test results provide insufficient evidence of how a person would function in an unfamiliar, unstructured, fuzzy and dynamic work context which may require integrative and creative thinking. Most personality tests are relatively transparent, easily manipulated, and rely on the self-insight and motivation of the test candidate. The constructs measured are a function of the methodologies used (including the questionnaires and the statistics) and are thus empirically rather than theoretically derived at. Although personality test results are useful for developmental purposes, they do not significantly predict work performance. 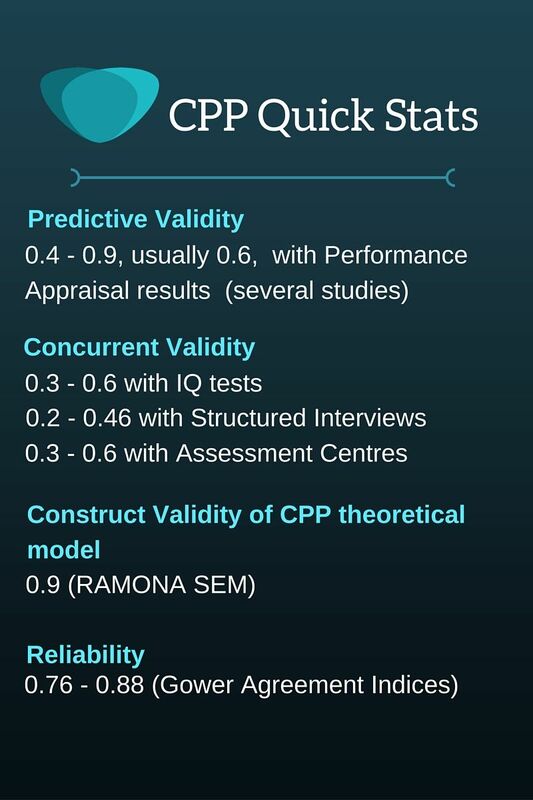 In a metastudy which summarised 7000 personality and EQ studies, the predictive validity of these tests was found to be around 0.09 to 0.25, clearly lower than the accepted score of 0.35. Interviews, structured interviews, assessment centers, 360 degree evaluations and performance appraisals are valuable, but the results may be affected by the subjectivity, projections or lack of insight of the interviewer; by the verbal skills and previous work experience of the candidate; and the level of rapport between the interviewer and candidate. People- or talent management involves planning which needs to be based on valid information. Assessment results are thus necessary to optimise organisational effectiveness; ensure meaningful work for individuals with diverse personal predispositions; and prevent risk and failure. But if current evaluation and assessment methodologies lack validity, reliability, applicability and appropriateness, what other options are there? Assessment ideally has to be conducted without having to capitalise on specific content, previous learning experience and acquired skills, empirically derived constructs and other factors that introduce assessment error, including speed, a test subject’s level of self-insight, the option to manipulate transparent criteria, interpersonal rapport and subjectivity. Existing assessment methodologies thus need to be replaced by techniques that may be based on an alternative approach to assessment, for example on action research, systems modelling and sound theoretical guidelines. The goal should be to objectively, cross-culturally and holistically access the current capacity and potential of individuals in an automated and standardised manner. The measured individual predispositions also need to be contextualised within a particular environment to ensure optimal systems integration. Cognadev aims to achieve just this by introducing a paradigm shift in psychological assessment. The techniques proposed have been used for two decades by approximately 1000 corporates globally. The assessments transcend the shortcomings of traditional techniques and are designed to zoom in on a meta- and subconscious level. Join our LinkedIn network to keep abreast of the lastest news.